Excited to announce Senator Andy Gardiner as our keynote speaker on Thursday, October 13th! A lifelong resident of the Orlando-area district he represents, Senator Gardiner works as the Vice President of External Affairs and Community Relations for Orlando Health. He previously served as the Executive Director of the Apopka Area Chamber of Commerce. Senator Gardiner and Camille, his wife of 17 years, are both graduates of Stetson University and the proud parents of three children, Andrew Junior (11), Joanna Lynn (7), and Kathryn Lucille (4). 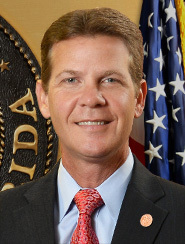 Join Senator Gardiner, senator of the 13th State Senate district and President of the Florida Senate, as he discusses his career as a noted healthcare pioneer in Florida and his passion for serving people with developmental disabilities.